My Hutt thread has made me think about how I would run a game where the players played characters that were either very rich or very powerful or both. How would you challenge your players? What would their adventures be like, especially if you rule out the idea of taking their power/wealth away from them. Let's say that the players are playing the rulers of the planet Lusdu, deep in the Core worlds. This type of game would definitely differ from your usual Star Wars game, but in what way? 1. Use Miniatures Battle System (whether you use miniatures or not) to conduct some large, grand battles. 2. Use Star Warriors to have some grand space battles. 3. Conduct Capital Ship Combat (possibly using the rules in the 1E Rules Companion) scenarios. A "mission" for the King of Lusdu may be to travel to the nearest Trade Federation world to negotiate a deal on the hyperspace routes connecting Lusdu to the rest of the galaxy. The GM would have to think about how to use the rules in a new way. For example, the Bargain skill may become the King's most important skill as he negotiates. Winning arguments may result in "argument points", where X amount are needed (like Victory Points) to get contracts signed. In the end, let's say that there are 10 total Victory Points to be had. The King ended up with 6 and the Trade Federation ended up with 4, so that would mean that the compromise made ended with Lusdu getting the upper hand, but still only getting 60% of what it wanted. There were concessions to be made. The GM would implement these concessions as he sees fit--say, for higher taxes to go to the Trade Federation. Other skills may be important to, to these Social Warfare checks. Alien Races. Bureaucracy. Cultures. Possibly, Planetary Systems, Languages (although I'm sure protocol droids are present). The burden is on the GM to come up with a good system for this type of "warfare" and make it fun for the players. In the hands of a good GM, this can be a welcome distraction from your typical Blaster shootout. There can be competitions of skill. Blaster target shooting. A Star Wars version of jousting, riding on some beast with an electroprod. And, the like. Gambling games like my own Fiz'zel, which you can see in another forum. Good old blaster fights and hand to hand combat can be inserted into the game with court intrigue that includes assassins, kidnappers, and the like. We see Mon Mothma and Bail Organa in lots of scenes in the movies, moving the grand pieces around that makes the Rebellion Against the Empire possible. Our leaders of Lusdu could get caught up in these details, having to leave Lusdu a lot because of the demands. This type of campaign may benefit from the players playing more than one character. They play the royals, who make the decisions, but rarely leave the world. When the Royals give orders, then the play switches to different characters--those who carry out the orders. This is one method for players get in on the action from all sides. 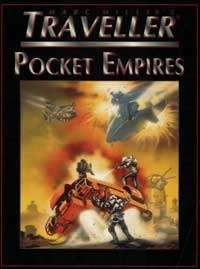 The 4E Traveller game, Marc Miller's Traveller, has a book in its lineup called Pocket Empires. This book uses what it calls mega-tasks, which are tasks that represent the work of several people. Like trade negotiations and such. Through a (looks to be complicated) process, a world's GWP (Gross World Product), or something of that sort, is figured out. The success or failure of the mega-tasks influence the prosperity of the world. And, the Nobles from that world make the mega-task rolls. I've always thought it an interesting system, but I've never used it. I do think, though, that you could simplify it and convert it to D6 Star Wars. I don't think it would be that hard to convert. Using rules like this, the players can see the effects that treaties have on the game--what actions, like a Trade Federation blockade, can do to a world. I think it would be very interesting (and some significant work on the GM's part) to play this way. The players play the nobles of the world. Trade negotiations go south (by a missed mega-task). The trade federation comes and blockades Lusdu. The Lusdu nobles secretly support the Rebellion. The Rebellion desperately needs supplies. The nobles hire smugglers to run the blockade and deliver the supplies to the Rebels. The players switch characters to play the smugglers now, in a more traditional D6 SW scenario where they have to run the blockade. This would all tie nicely into a Tapani Sector campaign. In a way, if you think about it, Lando is one of these types of characters. Except, when we've seen him in action, he has lost that which makes him wealthy and powerful. In TESB, he lost the Bespin Mines. In HttE, the first Thrawn book, he lost his other Mining planet. And, in both cases, he was free to adventure. I did have a game where I did this. Most of the characters were force users and rapidly gaining in ability, but our single non-force user was a Twi'lek mobster. To counteract the inability, I gave him money and influence... and a couple Gamorreans nicknamed Guido and Nunzio. The mobster had reach and connections... he could set things up and get them done, and usually make bank while doing it. If it came to violence, Guido and Nunzio took care of the violence. But our mobster's ability to find things out and take care of logistics made him valuable, while the player took care of being personally fun to play with.